As parents, we all want our children to be healthy and fit. But we live in a nation where all of us – children and adults – are tempted daily by fast food, sugary and salty snacks, and the lure of computers, television and video games. The statistics on childhood obesity are startling. According to the Centers for Disease Control and Prevention, the number of children and adolescents in the United States who are considered obese is about 13.7 million. That’s more than the populations of New York City and Los Angeles combined! It’s a situation we’re acutely aware of at Kiddie Academy® Educational Child Care and diligently working to address. That’s why Health & Fitness is one of the four pillars around which our Life Essentials® philosophy is built. “The health of the children in our care and the development of healthy habits is a top priority at Kiddie Academy,” said Richard Peterson, the company’s Vice President of Education. “We’re committed to combatting the epidemic of childhood obesity by teaching our children, from the very start, the healthy habits they need for a lifetime. That means focusing on eating right, integrating physical exercise and maintaining healthy personal habits every day. 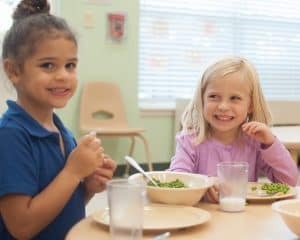 At Kiddie Academy, we believe meal time is an excellent time to instill a variety of important life lessons. Our meals are served family style, where your child eats alongside teachers and friends. It provides an opportunity for them to taste and enjoy a wide variety of nutritious foods while learning the basics of healthy eating. We also believe that physical exercise is an integral way to enhance children’s health, motor skill development and social skills. At Kiddie Academy, children go outside every day, unless it’s raining, very cold or extremely hot. Get kids involved in meal planning – Allowing your child to help plan your family’s menus is a great way to let them feel invested in the meal while learning about healthy foods. Make healthy snacks available – Offer apple slices, carrots, whole wheat crackers they can munch on as an alternative to sugary, salty processed snacks. Exercise during commercials – If you’re watching television together, during commercial breaks have everybody get up and move around. You can do jumping jacks, pushups, situps or simply dance. Every step counts – When you’re out shopping or running errands, park farther from your destination so that you get the benefit of a longer walk. Instead of taking an elevator or escalator, climb the stairs. All those extra steps add up to better health. Be a good role model – If children see you eating healthy and exercising, they’re more likely to do the same.